A slab, due to its loading (self weight, marble floor coverings, human activities etc) and also due to its elasticity, is deformed in the way shown at the following picture. The real deformation is in the order of millimeter and although it is not visible to the human eye it always has that same form. 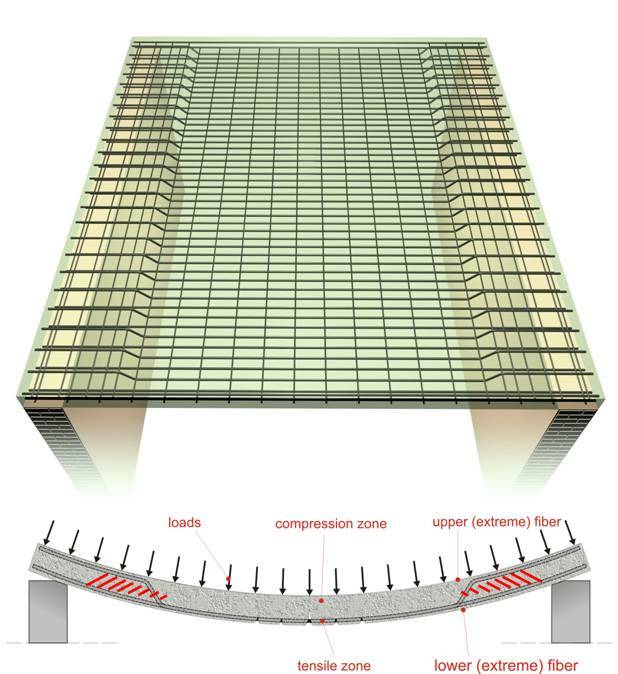 Concrete has a high compressive strength; therefore in the compression zone where there are only compressive stresses, no longitudinal reinforcement is applied. On the contrary, concrete has a very low tensile strength therefore in the slab’s tensile zone where there are only tensile stresses, longitudinal reinforcement is applied. The introduction of reinforcement in concrete, results in a material with the ideal combination of compressive and tensile strength. In the tensile zone of the slab and especially in the middle of its span, hairline cracking occurs on the concrete’s surface. These cracks may not be visible to the human eye but they exist, without though affecting the slab’s behavior. Diagonal stresses appear on the slab’s support faces but as a rule they are dealt with by the concrete thus no transverse reinforcement is needed. In the upper extreme fibers of the slab supports, it is possible for tensile stresses to appear; therefore a minimum amount of longitudinal reinforcement is placed in these areas. That rein-forcement may be autonomous, may be slab-span reinforcement continued up to the supports or it may be a combination of those two. In this specific example the upper (negative reinforce-ment) comes from the slab’s span reinforcement (bent up rebars). Generally, slabs are not practically affected by seismic forces in their plane and that is the rea-son why they are not extra reinforced in order to withstand them.